The CBERD team recognizes that buildings in the United States and India account for 40% of their nation’s energy consumption, and both countries are among the highest energy users on the planet. The CBERD team conducts collaborative research and development to develop accelerated, measurable and significant reduction in energy use in buildings. The vision for CBERD is to build a foundation of collaborative knowledge, technologies, human capabilities, and relationships that position the U.S. and India for a future of high-performance buildings. The focus is on the highest growth sectors, i.e., commercial and high-rise multi-family buildings. While key targets are new construction in India and retrofits and existing operations in the Unites States, the results are likely to have spillover benefits to other building sectors. 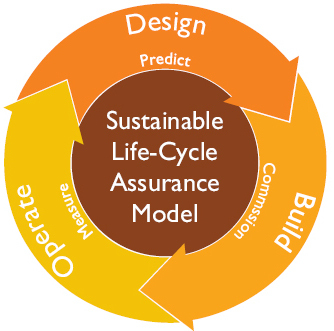 After conducting an analysis of how buildings in India and the U.S. use energy, CBERD has created a Lifecycle Performance Assurance Framework (LPAF) that supports building system integration throughout the building’s design, construction, and operation. This is a departure from the conventional, fragmented approach of the building industry. This approach enables an integrated whole-building view to assure high performance, both in terms of energy efficiency and comfort/service levels. In the LPAF framework, critical integration occurs between the buildings’ physical systems by utilization of innovative building information technology. This creates metrics at the three stages of the building lifecycle, in order to predict (design phase), commission (construct phase), and measure (operate phase) the building performance. CBERD focus is on applied R&D, including innovative cooling and daylight/lighting technologies, passive and envelope design, and products that suit indigenous needs, regional variations, and climate diversity. Work on this objective will generate solutions geared toward Indian applications and advance appropriate regional and local technologies. The knowledge and lessons learned from applying these solutions cost-effectively in India will be documented and applied to the U.S. Our R&D will focus on both technology solutions and regional adaptation that can leapfrog transitional technologies while developing and advancing appropriate regional and local ones. In order to bridge the gap between standards and their implementation, CBERD is developing design specifications, decision tools, algorithms, methods and guidelines. These are supported by methods of benchmarking and data collection in order to achieve the five-year performance targets for commercial buildings, to enable the opportunity for significant improvements in energy performance. CBERD is overcoming knowledge gaps of the buildings research, design, and developer communities through researcher exchanges at the national labs, and training and education curricula provided by the academic partners in the consortium. CBERD is also engaged in documenting, demonstrating, and leveraging the consortium-wide use of the test-bed facilities to this end. Boosting the two-way knowledge transfer and capability levels of buildings stakeholders is facilitating information exchange and helping accelerate workforce development efficiencies to the U.S., India, and industry. CBERD is harnessing team complementarities to provide advanced building systems and methods, and site-specific solutions and practices to cohesively create significant and dramatic impact in both nations.